NEW YORK - July 21, 2015 - PRLog -- In late June Nino Khayyam released his second single “Movie” and it has been very well received. “Movie” is gaining air play on several radio and mix-show outlets including New York’s number one urban FM station Power 105.1 and blowing up social media. 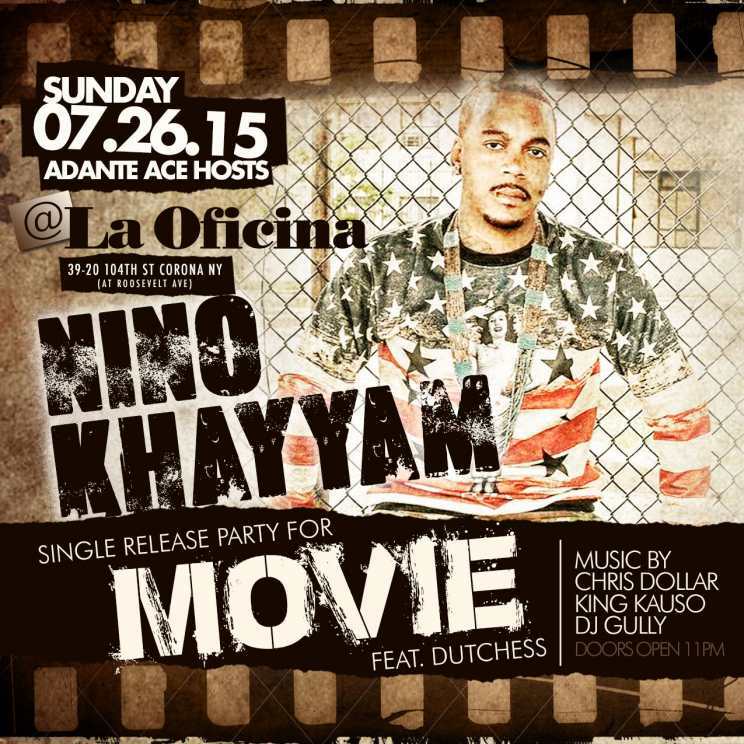 On Sunday July 26, 2015 Nino Khayyam will celebrate his success at “Show Me The Money Sundays” at La Oficina Hosted by New York Super Promoter Adante Ace. Nino Khayyam is no wet behind the ears upstart artist, to the contrary Nino Khayyam is the epitome of what “the successful independent artist” should look like. Born and raised in Brooklyn and the son of immigrant parents, Nino understands the value of hard work and careful planning. Nino has done everything right to make it in this game. First put a great team together; second work with veteran producers who have proven success record and finally add hot lyrics. Nino Khayyam found success earlier this year with the street hit “F.W.N.” produced by legendary hit-maker Ty Fyffe. “F.W.N.” has been well received on the club scene and began to circulate through various social media outlets setting the stage for Nino to release a follow up. Just in time for summer Nino Khayyam dropped “Movie”, a radio ready club banger that has an infectious beat, dynamic chorus and stellar lyrics. “Movie” has already made into the lap tops of several of the top club deejays in New York City and began to receive major radio play. The sky is the limited for this artist, in time when the industry has branded New York based artists as irrelevant Nino Khayyam is the champion the streets have been waiting for to finally bring New York Back!